Ronald Clyde Gardenhire was born October 24, 1957 in Butzbach West Germany. His family migrated to the United States, settling first in Oklahoma where Gardenhire went to high school. He then attended college at the University of Texas at Austin. 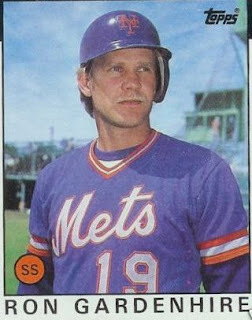 The six foot right hand hitting infielder, was drafted by the New York Mets in 1979 in the sixth round. In his first pro season he made the Carolina League All Star team while at A ball Lynchburg. He was promoted to AA Jackson in 1980 & then had a fine season at AAA Tidewater in 1981. 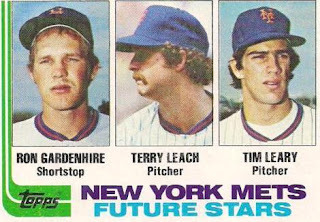 He hit just .254 but played a fine defense & made it to the Mets team by September 1981. He debuted on September 1st at the Astrodome, as a pinch runner for Rusty Staub & stayed in the game playing at second base in a 3-2 loss to the Astros. He went 13 for 48 that month good for a .271 average. He played mostly at short stop (18 games) posting a .969 fielding %. 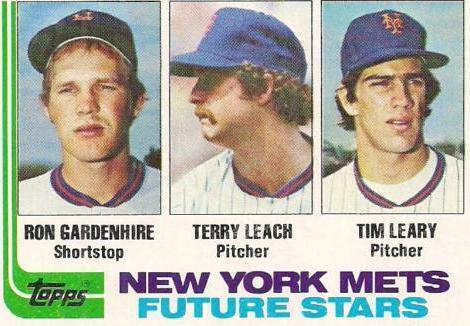 The next season in 1982 he got the Mets main short stop job after the departure of veteran Fran Tavares. he saw the most playing time of his career playing in 141 games, making 29 errors (third in the NL) while turning 68 double plays. On April 11th at Wrigley Field he singled in the top of the 6th continuing a Mets rally that he helped tie the game, in the 8th he added an RBI sac fly for insurance in the 5-4 Met win. He was certainly not known for his power but he did hit three HRs on the year. On June 29th with the Mets behind 4-3 in the 7th inning, he hit a two run HR off the Expos Ray Burris in Montreal, leading New York to a win. On September 22nd Gardenhire hit a surprising walk off HR against Byrn Smith to beat the Montreal Expos in the 10th inning. Overall he batted .240 with 3 HRs 17 doubles & 33 RBIs while stealing five bases. In 1983 he wasn’t hitting, batting just .083 in early May when he was sent back down to AAA Tidewater. There he hit .287 but kept getting hamstring injuries which certainly added to shortened his career. He returned to the Mets in September & by now Jose Oquendo had become the teams main short stop. He finished the year batting .063 playing in just seventeen games. 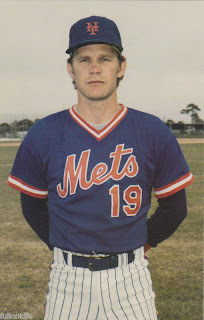 In 1984 he spent the entire season up with the Mets big league team. He played in 49 games at short stop, behind Oquendo & Rafael Santana who would eventually take over the position. On the year he hit .246 in 74 games posting a .947 fielding % at short stop. Gardenhire, played in just 26 games with the second place 1985 Mets as injuries kept nagging him. He would bat .179 with two RBIs. In the 1986 Championship season he spent the entire year at AAA Tidewater as well as missing time due to injuries. In November of 1986 he was traded to the Minnesota Twins for a player to be named later. Manager: He never played on the Twins big league squad & ended his playing career in 1987 at age 30. He soon managed in the Twins minor leagues winning two first place finishes in three years. He was promoted to the Twins big league team as the third base coach in their 1991 Championship season. 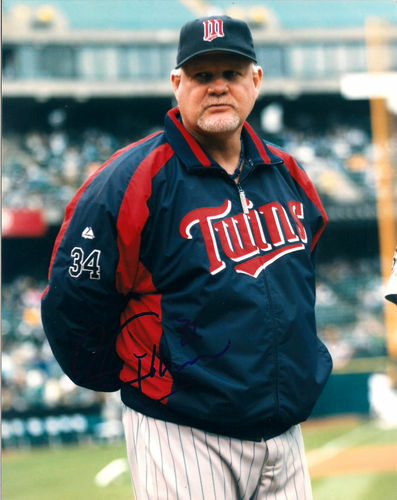 He was a Twins coach for eleven seasons before being named manager in 2002 as Tom Kelly’s replacement. Kelly was had a very quiet demeanor about him, and Gardenhire just the opposite. He is fiery & aggressive known to exit the dug out to argue with umpires quite often. 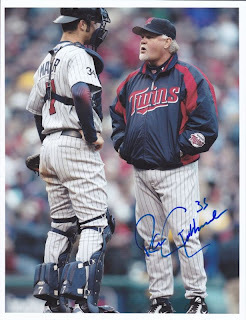 He is known as "Gardy " & is a very successful manager for the Twins over the past decade. He has made the post season six times as manager and only had three losing seasons. After finishing third or better for nine seasons, the injury ridden 2011 Twins finished last, the worst season of Gardenhire's career. The Twins finished last again 2012, although that season he won his 900th games as a Twins manager. In 2013 the Twins finished fourth but in 2014 they fell one more spot to last place. His Twins have won 90 games or more five times, with a career high 96 wins in 2006. On the down side; his teams have been eliminated in the first round of the playoffs each time with the exception of 2002. That season they lost in the ALCS to the eventual world champion Anaheim Angels. Through 2014 Gardy has managed the Twins for 13 seasons, second only to Tom Kelly (15 seasons) since the franchise moved from Washington D.C.
Family: His son Toby was born in Manhasset, Long Island New York during Ron’s days with the New York Mets. Toby was an infielder in the Twins organization through 2011. In 2012 he was named head coach at University of Wisconsin (Stout).